Adna Romanza Chaffee was born at Orwell, Ohio, on 14 April 1842. He entered the Army by enlisting in the 6th Cavalry in July 1861. Soon he was promoted to sergeant and participated in the Peninsula and Antietam Campaigns of 1862. In 1863, Chaffee received a commission as a second lieutenant for battlefield valor. He was wounded twice during the Civil War and was brevetted captain for gallant action at Dinwiddie Courthouse. He was a full first lieutenant before the end of the war. Chaffee was promoted to captain in 1867 and in 1868 he married Kate Haynie Reynolds, who tragically died the very next year. For the next several years, Chaffee fought the Indians; at Paint Creek, Texas, he was brevetted major, and at Red River, Texas, his action earned him a brevet lieutenant colonelcy. In 1897, he became a full colonel. In 1898, Chaffee was quickly promoted to brigadier general and then to major general of volunteers. 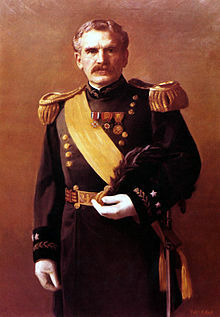 During the Spanish-American War, he led a brigade against Santiago and afterwards, he served as the chief of staff for the military governor of Cuba. In 1900-1901, Chaffee commanded the U.S. troops sent to China during the Boxer Rebellion. He became a major general in the regular army in 1901 as well. In the next couple of years, he served as governor of the Philippines and led the Department of the East. Promoted to lieutenant general in 1904, Chaffee served as Chief of Staff of the United States Army from 9 January 1904 to 14 January 1906. During his tenure as Chief of Staff, Chaffee established territorial divisions to supervise the field departments, urged the use of canteen services to curtail disciplinary problems, sought increased officer strength, and supported increases in quarters allowances. Chaffee retired from active service in 1906 and became the president of the Board of Public Works of Los Angeles. He died in Los Angeles, California, on 1 November 1914.